There are many languages which are spoken all over the world. To have good communication skills, a person must have good command over the language. People want to have good command over the language, but they never know which is the best way to accomplish their requirement. People often get confused about how to learn or best ways to learn vocabulary words fast and effectively. How to Learn Vocabulary Words Fast and Effectively? 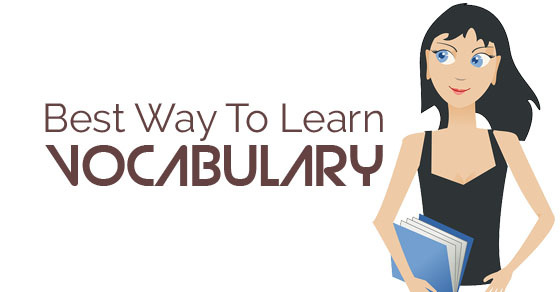 The following mentioned tips explain to you how to learn vocabulary quickly, fast and in an easy way. People who want to learn a new language, do not know the new words and they don’t have any idea as to how to fill the gaps in between. Whenever a person wants to learn a new language, then he should continuously talk to himself about various things like what he likes or what he wants to be…and so on. By doing this, he will be able to understand the areas where he is lacking and he can make the necessary corrections. One of the best ways to memorise things is to make a list of all the things that a person wants to remember. Always keep a book and whenever there are words which need to be remembered, then list them and make use of them whenever required. By maintaining the list the person can have his own pocket dictionary and he can carry it wherever he wants to. If a person gets into the habit of reading, then a person is exposed to new words. Always make it a habit to underline the new words and refer to them in the context section and try to understand their meaning. By doing this, you will remember the words and will be able to make its correct usage. People always make use of context section whenever they are introduced to a new word. While a person reads or writes, always pay attention to the usage of the words. This will allow a person to know the correct usage of the word and will remember it for lifelong. There are various online sites which give detailed classes as to how to improve upon the context skills. The best way to learn any language is to practice it. A person can practice it by writing it on a daily basis. For this a person can write the word at least ten times daily and also make sentences with its meaning. This will help not only to learn words, but also the meaning as well. By maintaining the dictionary, a person can write 5 to 10 words to learn on a daily basis and refer to it whenever needed. Whenever a person listens to a word, he should try to connect it to a word of similar meaning or words which help you to remember them. For example: If a person wants to remember the word gigantic, then he should connect it with Godzilla or any other rhyming word. This will create a picture in the mind of a person and he will be able to remember the meaning as well. People often don’t know about mnemonics. It is the device which is used to make people learn about the new good vocabulary words. This device helps to create a story in the mind of its reader so whenever he listens to it, he can connect it with that word and know its meaning. There are different ways under this technique and a person can choose from the variety of ways, as every person has his own best way to learn vocabulary. Always make it a habit to look out for new best vocabulary words every now and then. These days there are a variety of online dictionaries that are available. These programs provide a chance to the reader to go through a variety of words and introduce them with new words every time they search for them. Make it a habit to play with words through various board games like Scrabble, crossword puzzles and many other for your vocabulary improvement. These days to play these games a person doesn’t need partners as a person can play with the computer as a partner. Also make it a habit to solve the crossword puzzle that are published in the newspaper for daily practice. Make use of the vocabulary word lists for the serious knowledge of the new words. These days there are many books available in the market for the knowledge of the words that are used in the competitive examinations. Also, various online sites are available where they provide knowledge about these words. One of the best ways to learn vocabulary is take your own tests. By taking your own tests, a person can easily evaluate the areas where he needs to work harder. Taking your own test will highlight your weaknesses and the corrective measures can be taken. These days online vocabulary tests are also available, so take these online vocabulary tests and find the areas of correction. Today the technology has advanced to a great level. There are so many online vocabulary games available that makes learning a complete fun. These games make learning not only entertaining, but much easier. Another important feature of these games is that they make learning much easier as well as the kids at a very young age can start learning through these games. Practical experience of any knowledge is the best way to determine the level at which a person stands. Through communication with more and more people a person can get the actual learning process to start. When we communicate with more people we get a better understanding of the language and we get to know the correct usage of the language. Try to imagine things whenever you listen to new words. This will automatically become your habit once you start practicing this thing. Like it is done in school where teachers make the students remember things by telling them a story and creating a picture in their minds. This habit of a person will help him to create a picture in the mind of its listeners. Never try to remember too many things at one go because this will create confusion and make it difficult to remember. Language is a way to express things and not a tool where you just have to apply a formula. Always try to connect the words with certain adjectives as they will add more meaning to the word and make it easier to remember. Whenever a person listens to a new word, draw a picture which will make a person remember it for a long time. For example, when a person is talking to another person in a new language and is unable to remember some words, then with the help of those pictures he can remember those words and can converse easily. Just like in small classes where teachers use pictures to make students remember alphabets and they recall them by remembering those pictures. Whenever we hear a word we try to know its meaning as well. So, whenever a person listens to a word try to remember its opposite as well because sometimes it is easier to remember the opposite rather than the word itself. By doing this you can remember the word as well as the opposite as well. This helps to learn two words at a time. Every individual has his own caliber to do things, although there are some exceptional cases. Generally, on an average a person can remember only 10 words that he learns at a time. So, try to set goals which are realistic rather than goals which are difficult to achieve. Even if a person sets higher goals for himself, then he has to put in extra efforts which may sometimes become an overburden. Always try to learn in cluster because it is difficult to remember a single word. Words when learnt in a cluster is a easy to remember. Whenever a person tries to remember words in a cluster he creates a picture in his mind and in the times of its usage there flows a chain in his mind. By doing this he can actually remember a large number of words at a time. Try to remember words by breaking them. There are certain words which have a suffix or a prefix attached to them. By dividing these words it becomes easier to remember them as they become two words to be remembered. Also, it helps to study the conjugations that are attached in these words. Try to focus on phrases that are commonly used because it is easier to words which are commonly used in day to day conversation because our minds tend to remember them more easily. This way the words are easily remembered and when combined in different combinations we get to frame new sentences easily. This is an easy way to remember a new language very easily. It is difficult to learn words when remembered in a theoretical manner. Music is that one thing which is loved by all, even kids can easily relate to it. Words can be easily remembered when learned in the form of a song. Whenever a person sings a song he can remember the lyrics of the song as well. Similarly, any language when converted in the form of a song can be easily remembered and when sung the words flow automatically. It is well-known fact that whenever we do any form of physical exercise our brain tends to do work at a faster rate than normal. So, whenever you hit the gym do take your dictionary with you and with the repetition of the exercise repeat the words along. As you know that by repeating the exercise we become perfect in them, same goes with the words also. Often it happens that we are very close to remember the word, but it is not possible for us to recollect that word because it is not photostatted on our memory. This problem can be solved by a simple technique of color scheme. Like we can write all the words in negative in red color and words with positive meaning in green color. This way you can easily recollect the words whenever you come across them. An effective tool for remembering the words is making the list of important words in order of the priority of their usage. This way whenever you go through a list of important words the ones that are important are revised earlier. Fluentu is an application which converts real world videos, trailers into personalised learning lessons. There are various levels in this application and the lessons depends on the level selected. Once it is turned to lesson mode the lessons automatically starts. Learning any language is a task when done in a boring way, but when done in an interesting way it becomes fun. So, use the above-listed techniques and get that command over the language.